One of my favorite peripheral characters in my novel, The Tedescos, is Officer Ted Conley. Lieutenant Conley first makes a casual appearance in a chapter where I mention him as a friend who is visiting Joe Tedesco’s bowling alley. Ted and Joe are high school football buddies who stayed in touch after graduation. It’s probably because I grew up around cops—my dad served twenty five years as a police officer—that I subconsciously chose the profession. But then I realized how handy it was to have a cop on the scene especially with a family like the Tedescos whose escapades sometimes require the compassionate arm of the law. For this reason, Officer Ted Conley makes several more appearances in my novel as both friend and policeman. I didn’t pin down exactly where the Tedescos live right off the bat because I want my readers to relate to them as members of their own family and/or as friends. Really, where they live isn’t as important as what goes on between them. But I mention their locale every now and then as well as drop in clues. One such hint came from my own memories of visiting my dad at work. The police station where my dad worked is located next to the courthouse, and in front of the courthouse are two amazing lion sculptures. They are the stuff of childhood fantasy, and more than once I imagined them coming alive. They made such an impression on me as a kid that is seemed natural to have Officer Conley waiting in front of one of the lion statues to be picked up by Joe for poker night. While the history of the courthouse is quite interesting, this blog post focuses on the lions. After the original courthouse was demolished in 1905, a new one was completed in 1908. The new building was designed in the Second Renaissance Revival style of architecture and included two male statues and two lion statues. The two seated males, one with a scroll and the other with a sheathed sword, represent law and justice. The two carved male lions are symbols of the law’s majesty and are sculpted of Salem Limestone (commercially known as Indiana Limestone). The lions, mirror images of each other, flank the courthouse sidewalk with one facing northwest and the other facing southwest. The lions rest on their hind legs with their front legs outstretched and mouths open slightly to reveal their teeth. The pair has impressively large manes, and their tails curl around and up to rest on their backs. They are placed on limestone plinths which set on mortared sandstone bases. 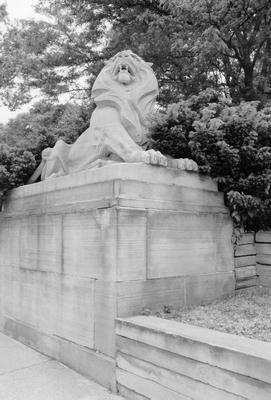 The lion sculptures cost $1,160 in 1908 which, according to an inflation calculator, would be $32,127.49 in 2017. In order to position the lions without cracking the stone base blocks, large blocks of ice were placed between the lions and the stone bases. As the ice slowly melted, the lions gently came to rest on their stone bases. The only information I could find about the sculptor was a snippet by someone commenting on another website. Supposedly, August Blepp, a master stonecutter, is responsible for the carved lions guarding the courthouse. I shall continue to search for any details regarding the sculptor and update this post as needed. Perhaps you noticed that I still have not mentioned the location of the lions or the county in which they and the courthouse reside. I enjoy a little mystery, and I’d rather these details be revealed within my published novel. Until then, I’ve provided a picture clue of one of the lions. I love this kind of background information. The bit about the ice is very cool! Pun intended. Thanks Heather. Thanks, Mark! I like your pun. Let me know if you figure out where the lions are. I would be lion if I said I knew where they are. 😉 I am going to guess they are not in Portland, Oregon. Happy Independence Day! I know exactly where they are but I will remain silent so as not to spoil the hunt.Excellent article. well written. Thanks! I wonder how many times you’ve driven past them.